For the last six years, City Council has dealt with each budget shortfall with a mixture of surplus funds, new revenue projections, property tax increases, investment income and spending cuts/efficiencies. The 2012 approach under Mayor Rob Ford has been different. Update: I’ve made a minor edit to the chart above to clarify how the implementation of the Land Transfer Tax & Vehicle Registration Tax changed the city’s financial situation. Quick summary: in 2008, both new taxes combined to take about $175 million in budget pressure off the city’s books. That new money was folded into expected revenues for future years, but LTT revenues tend to surpass staff estimates, resulting in extra cash in 2009, 2010 and especially 2011. Through this Core Service Review process, the (growing) group of councillors opposed to Mayor Rob Ford’s fiscal strategy has continuously complained about a lack of information. While Budget Chief Mike Del Grande and assorted hangers-on have been quick to cite a figure of $774 million as the opening “pressure” for 2012, they’ve been less forthcoming with revenue figures that will significantly reduce that pressure. Increased revenues from the Land Transfer Tax in 2011 alone look to total almost $80 million. And remaining surplus dollars from the 2010 and 2011 budget years could total another $100 million or more. Add in potential investment revenues, dividends from Toronto Hydro, assessment growth and other miscellaneous revenue lines and that big scary $774 million figure looks to drop down to something a lot more manageable. The chart above reveals why this revenue information is so critical: each year, that opening pressure figure — which, it should be noted, was bigger in 2010 than it is this year — is brought down through a variety of strategies. 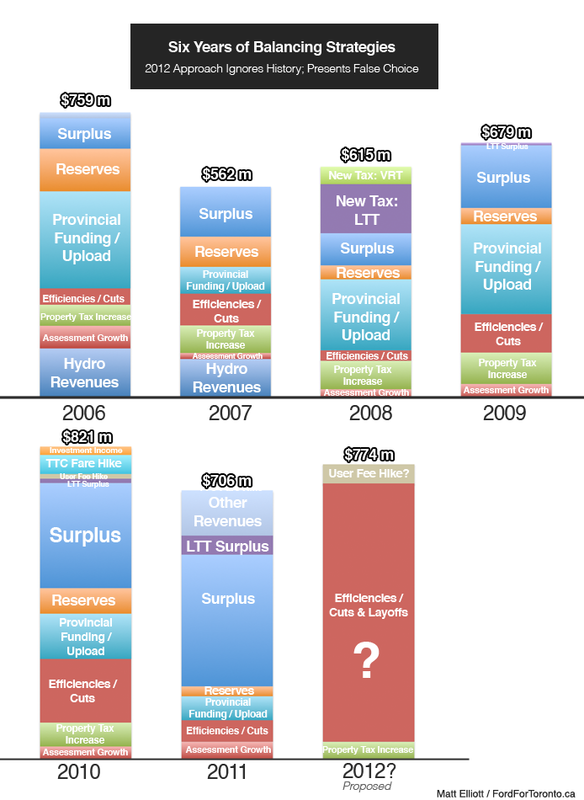 Yes, there are spending cuts and efficiencies — Rob Ford’s favourite things — but also other revenues. Each year — until this one — the budget has been balanced without apocalyptic talk of slashing childcare, closing libraries and decimating public services or else raising property taxes by 35%. That’s a false choice. It’s one that ignores the balancing strategies used over the past five years that have kept the city moving forward. Critics would point to the chart above and say that the budget balancing strategies employed by Mayor David Miller, Budget Chief Shelley Carroll and the rest of the the left on council were largely unsustainable, short-term fixes, relying too heavily on reserves and other one-time funding sources. And, for the most part, that’s true. That said, if you believe — as even right-leaning councillors like Giorgio Mammoliti and Doug Ford seem to these days — that the city’s structural deficit is due in part to the province, who reneged on its responsibilities for supporting things like transit, child care and welfare, then one-time strategies tend to be the best Toronto can hope for these days. Unless the province comes to the table and commits to uploading more transit costs, a truly sustainable 2012 budget — one that doesn’t completely destroy the kind of public services that contribute to the economic viability of our city — is nearly impossible to achieve. That doesn’t mean, however, that there aren’t paths Toronto can take toward fiscal independence. A service review process and efficiency study — like the one we’ve just been through — was a good idea, but the timeline needed to be longer. Set annual goals to increase across-the-board efficiency and work with management to achieve them. You’ll save more money this way than you will with layoffs. Set a long-term path forward for residential and commercial property tax rates. A multi-year strategy to put the average residential tax levy on par with, say, Markham would bring in vastly more revenue. Commercial rates should continue to decrease relative to residential. Review tax increase deferral and cancellation policies for seniors and disabled residents to ensure we’re not kicking anyone out on the street. Consult with Metrolinx on their upcoming revenue strategy to ensure that a fair percentage of revenue from road tolls — an inevitability in this province — go toward transit operating costs, in addition to capital. Review parking rates and increase them in downtown, high demand areas. Think like the private sector. Look at new revenue sources, including a City of Toronto sales tax. Big cities across the world have one, and they’re not dying because of it. We keep hearing about the necessity of hard choices: here’s one. The key is to think long-term and not to rush toward slash-and-burn fixes. More than any other level of government, municipal public services are directly tied to economic success. We can’t afford to risk that. This entry was posted on Wednesday, September 28th, 2011 at 12:41 pm	and is filed under feature. You can follow any comments to this entry through the RSS 2.0 feed. Both comments and pings are currently closed.